League Two side Burton Albion have named former Leeds and Chelsea striker Jimmy Floyd Hasselbaink as manager. The 42-year-old succeeds Gary Rowett, who joined Birmingham City last month. "I'm looking forward to working with the players. Until now they have done really well and I'm looking to take them a step further," said Hasselbaink. He is the third black and ethnic minority manager in the Football League alongside Huddersfield's Chris Powell and Carlisle United's Keith Curle. Former Leicester City and Manchester City midfielder David Oldfield, 46, will become Hasselbaink's assistant after being released from his role as head of Milton Keynes Dons' academy. 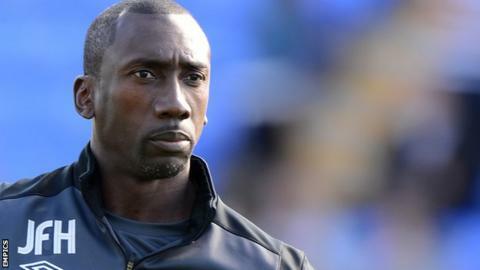 Hasselbaink, who also played for Middlesbrough, Charlton Athletic and Cardiff City in English football, stepped down as manager of Belgian second division side Royal Antwerp in May after finishing seventh and said he hoped to get a manager's job in England. He last worked in England as a coach at Nottingham Forest under Steve McClaren and the former England manager, now in charge of Derby County, is reported to have recommended him to the Brewers. "I have not played myself at the Pirelli Stadium but I have coached the Nottingham Forest Under-21s at the stadium," added Hasselbaink, who won 23 caps for Netherlands. "I'm also delighted with our training facilities being at St George's Park - they are the best in the country, which was a plus on my decision." Hasselbaink's first home game will be on 22 November when Albion - fifth in League Two - entertain Luton Town. Burton chairman Ben Robinson said: "Jimmy and David have great records as professional footballers and have already gained some knowledge of football management. "They are inspirational individuals, great coaches and this is a marvellous opportunity for them to take important steps on the managerial ladder."